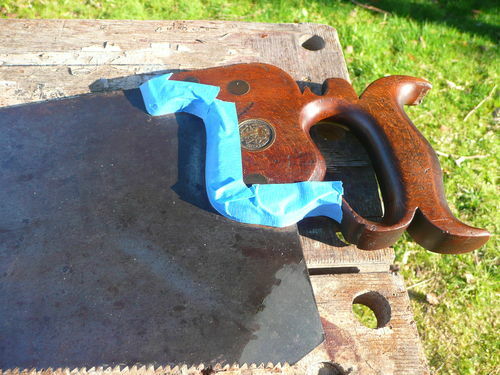 Recently I posted a restoration story of an old Skinner 6” sweep brace (you can read it here if you missed it) where I used Hammerite Rust Remover Gel. 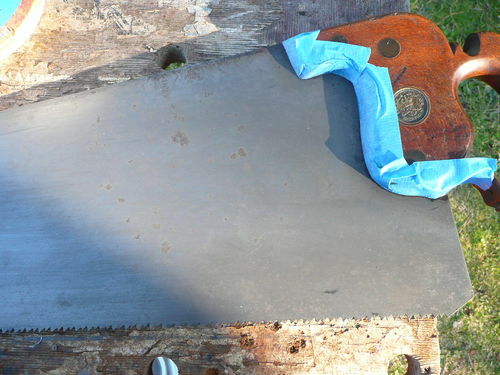 Since people showed a lot of interest in this product, I thought I would do a proper review as I use it to clean the saw plate on a wonderful vintage Spear & Jackson hand saw. You can read all about this gorgeous piece of English heritage here. The gel is available in three sizes: 75ml, 100ml, 225ml and 750ml. I bought the largest size from a local auto supplies shop for £10.29 (date purchased: 3/3/2011). One tub will probably last you a long time. Hammerite Rust Remover Gel is available in a number of countries and you can find retailers in your country by visiting their web site. Hammerite make the following claims about this product. Specially developed for the safe and effective removal of rust from metal items. Non-drip, can be applied to vertical surfaces. After use, clean tools under running water. Hammerite also make a dip, although I haven’t tried that yet. 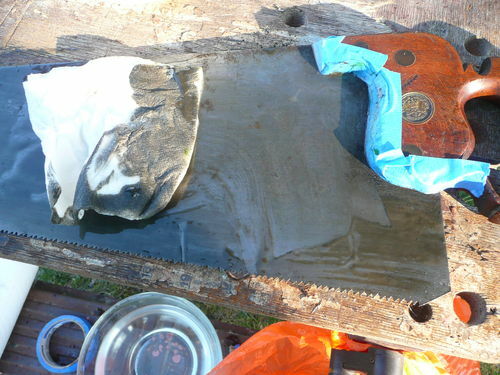 Anyhow, here’s how the gell performed on the saw plate. I started by gathering together the things that I thought I might need to clean the plate. 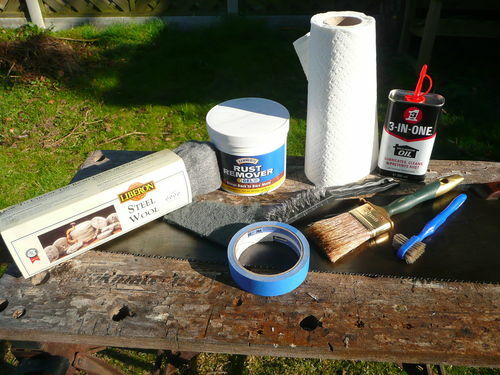 Some 0000 steel wool, a fine Scotchbrite pad, Hammerite Rust Remover gel, masking tape, a small soft wire brush, absorbent kitchen roll, 3-IN-ONE oil, a 50mm paint brush and a small nylon bristled brush. I might not need all of these, but I got them just in case. Since the handle is affixed with four brass split nuts which have never been removed, I decided to clean the saw plate with the handle still attached. 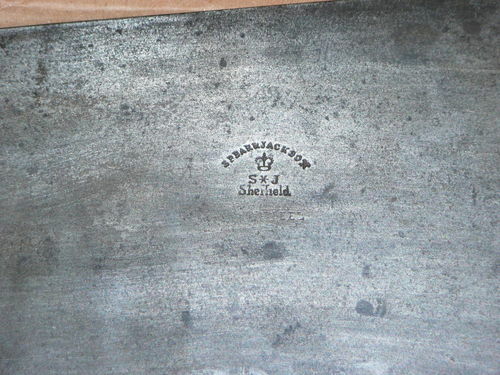 I would have preferred to remove the handle so that the whole plate could be cleaned and I could test the gel on a small area of the plate that would be hidden by the handle. However that wasn’t an option here, so after masking up the handle I decided to a test a small area at the heel of the plate. As you can see in the following photo, the results looked promising and this gave me the confidence to proceed. Working on one side of the plate at a time, I applied the gel liberally using the 50mm paint brush. After applying the gel, leave it to work for 20 minutes. Other than the odd tiny air bubble, there’s no evidence that the gel is actually doing anything, but have faith because it is. When you return after 20 minutes you will see that the gel has turned from bright green to a rusty brown colour. Now I carefully brush the surface with a worn, SOFT wire brush. I dip the wire brush in a bowl of water and then move the brush slowly back and forth along the length of the plate applying very light pressure. If there is a portion of heavy rust which does not want to come off, RESIST the temptation to scrub harder. The gel removes the rust in layers and any stubborn deposits will be removed with the next application of the gel. Warning: I know what the effect of using this wire brush will be. 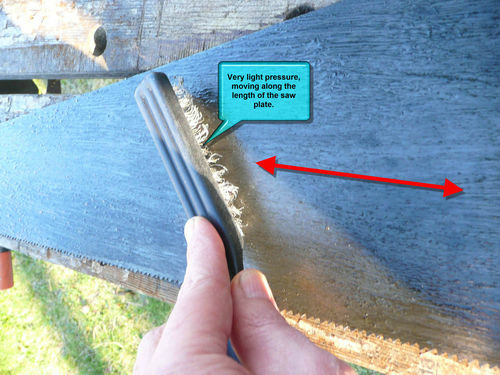 I have used it a number of times before and this gives me the confidence to use it on this saw plate. If you do not want to risk scratching the surface of your tools, use a stiff nylon or brass brush instead, or a fine Scotchbrite pad. Also, DO NOT use a wire brush on a saw plate that has an etch (This one is stamped). Use a sanding block and wet and dry paper instead. When the entire surface has been brushed, I wipe the surface with an absorbent paper towel, moistened with water. This is the fun part where you get your first glimpse of the gel’s effect. Smaller items can be rinsed off under running water. Continue wiping the plate until all the gel has been removed, then immediately dry it thoroughly with paper towels. TIP: For items that you cannot dry adequately with a paper towel, use a hairdryer to drive out and any remaining moisture. If your item has only light surface rust, one application of the gel should remove it so at this point you would be finished. 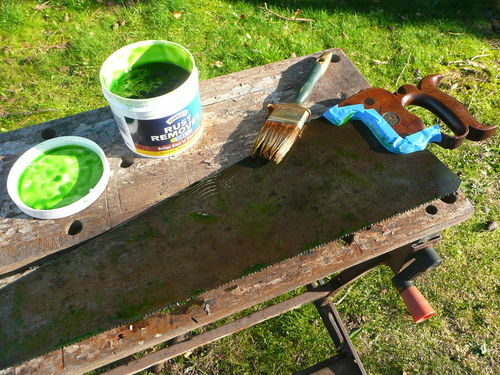 For heavier rust it will be necessary to apply the gel 2 or 3 times until no rust remains. 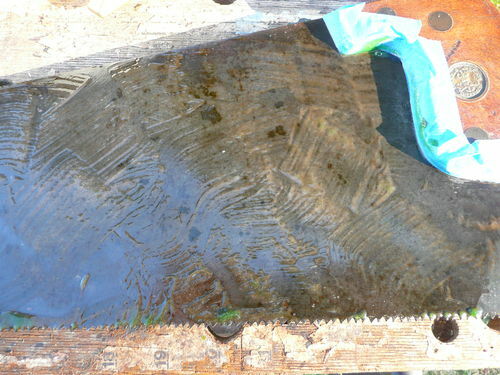 Most of the rust has been removed from this saw plate after just one application of the gel, but just to be sure I decided to apply the gel one more time using the same procedure as before. After waiting a further 20 minutes, brushing the surface with the wire brush and cleaning the surface for a second time, this is how the saw plate looks. The dark patches that remain are the areas where there is pitting. Although they are darker, no rust remains. If you are wondering why the surface is dull, that has nothing to do with the Hammerite Rust Remover gel. 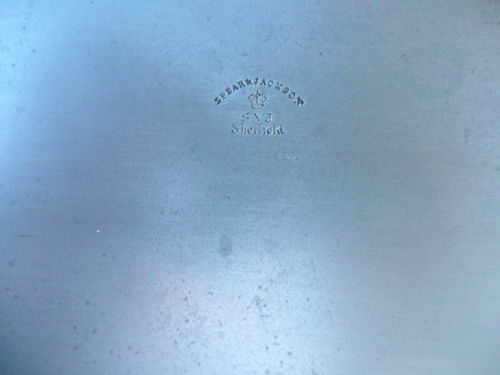 It is because the plate is made from gray cast steel. It would have been shinier when it was new, but then I had less wrinkles when I was young :-). 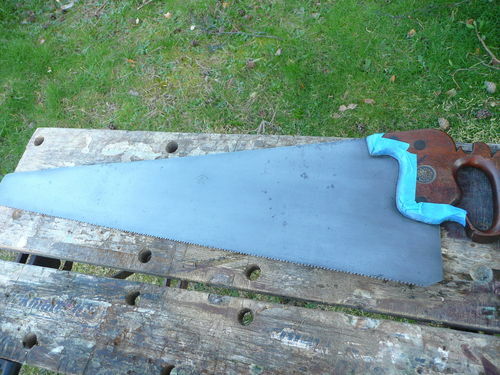 That’s about as good as I can hope to get this particular saw plate. So after two applications, the gel has done what it said it would do. How long did it all take me? Total elapsed time including waiting for the gel to work = 47 minutes 20 seconds. Of course I’ve still got to do the other side, but I won’t bore you with that. I think you’ll agree that it is pretty impressive. I’ve used this product to restore three tools now. This saw plate is made of gray cast steel and the other two tools were nickel plated and chrome plated. The gel produced great results on all three tools and I’m happy to give it the thumbs up. When my tub of gel runs dry, I’ll definitely be getting a refill. Thanks for reading this review. I’ll leave you with the obligatory before and after shots of the saw plate. Hi Dennis, It says nothing about diluting it with water on the container. If you added 10 parts water to every 1 part gel, you wouldn’t have a gel anymore and it certainly wouldn’t stick to vertical surfaces like they claim. No, you use it as it comes out of the container. Thank you so much for this review! I will try this product without a doubt. It looks like it worked well on the brass or is that something magical you did? I didn’t see USA listed on their website. Does anyone know if it is available here in the states? If it is not available in the good ol’ US of A, what would be a comparable alternative? Hi Bertha, No I didn’t use it on the brase split nuts and medallion. For that I just used a household brass cleaner. The medallion is still not completely clean and I’ve spent about 2 hours on it so far. Of course it would be easier if I dared to remove it, but I’m not repared to risk braking it so I’ll just keep working at it until all the crud is removed. I suppose a few hours cleaning is nothing when you think that it has been building up for the last 100 year or so. It’s so gorgeous and I applaud you for letting it shine. Like you, I’d never pry a pin or medallion. It is really a pleasure to admire and I really appreciate you sharing it. Great review. I really like it when you explain things in detail and even give warnings about potential problems. The pictures add to the review. A picture is worth a thousand words. Maybe a closeup before and after would reveal more details. Looking forward to more reviews. Hope we can get here in the states. Thanks Grant. Here’s a before and after closeup for you. Thank you for the review and the tutorilal, as you know I fave seven saws haning in the workshop waiting for my love, so I think I will try this product if I can get it in Denmark. Mads – You’re very welcome, I hope it helps. 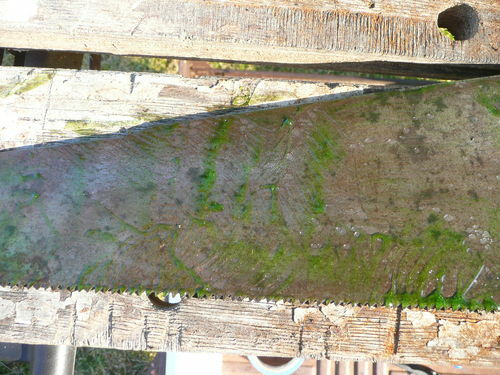 I can’t wait to see your saws. I hope you post lots of pictures, especially the ones that have been in the same family for three generations. It sounds like a naval jelly. I have used naval jelly with similar application and results. Is naval jelly safe to use when restoring metals? Will it harm the metal being treated? Just wondering, as I have not noticed anything on my clean-up projects.